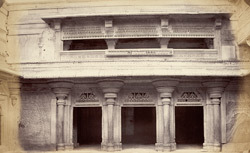 Photograph of the north facade of a courtyard in the Man Mandir Palace at Gwalior Fort in Madhya Pradesh, taken by an unknown photographer in c.1882, part of the Gladstone Collection. The great hill fortress of Gwalior, strategically sited in central India, was a centre of power for centuries. Its ancient origins and tumultuous history can be traced back to the sixth century, since when it has been the contested possession of a succession of rulers including the Rajputs, the Mughals, the Marathas, and the British. It rose to great prominence during the period of Tomara Rajput rule between 1398 and 1518, especially during the reign of Man Singh (ruled 1486-1517). The Man Mandir was built by Man Singh and is considered to be one of the most remarkable early Hindu palaces. It has two small inner courtyards, surrounded by suites of rooms. This is a view of the north facade of the outer courtyard, showing the entrance to one of the rooms. The walls, doorways, capitals and balcony are richly decorated with elaborate relief carving and pierced jali screens.